Lantana is a large plant genus with about 150 species of flowering plants, which are perennial and native to the West Indies, according to the University of Florida. Lantanas are grown for their attractive clusters of small, multicolored or single-colored flowers and for their medicinal uses. Some species can reach 6 feet in height, while others are low-growing ground covers. Flowers on many species change color as they mature, becoming darker with age. The state of Florida has a native species of Lantana called Lantana depressa, or gold Lantana, which is classified as endangered. This rare plant is a creeping groundcover with yellow flower clusters and is native to the southern Florida county of Miami-Dade. This Lantana has become threatened due to many years of land clearing, road building and development of cities and suburbs. This species is almost too easy to grow--it has escaped cultivation and has become invasive in California, Florida, Hawaii, China, New Zealand and Australia, according to the University of Florida. The flowers of this rampant plant are unusual because several different colors exist in the same flower cluster--you will often see a combination of small yellow, orange and red flowers on the same plant. The flowers emerge as yellow and then darken with age, becoming orange and red. If they are pollinated, they then drop to the ground and the plant forms small black berries that contain numerous tiny seeds that birds often eat and then help spread through their feces. Lantana camara is a serious weed in Florida’s orange groves. 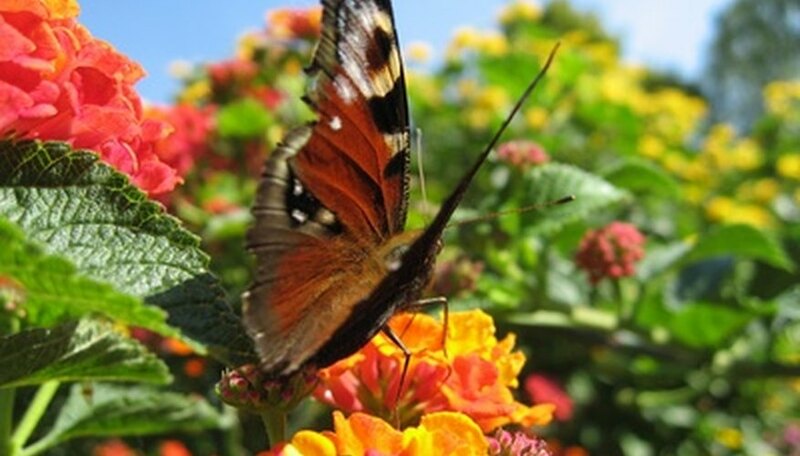 Of the more than 100 species of Lantana, not all are considered invasive. If you’d like a pretty lavender Lantana, try the Montevidensis species, which is also called weeping Lantana and trailing Lantana. It is native to South America and forms a woody shrub that reaches only about 2 feet in height. It performs as a perennial in areas that receive no frost but you can grow it as an annual in other climate zones. It has not proven to be invasive. This Lantana is also known as button sage and has the same typical clusters of flowers as other Lantanas, but on this plant they begin white and then fade to lavender. It has many branches and grows to about 3 feet in height. Lantana involucrata is native to Florida, Puerto Rico and the Virgin Islands. Pink Caprice Lantana has white or pale yellow flowers that fade to pink. It’s a good plant to grow if you want to attract butterflies to your garden. Bandana is a hybrid of Lantana camara that has yellow and crimson flowers. Other Camara hybrids include: Goldsonne, which sports all-yellow blooms; Confetti, which has pink and yellow flowers; Patriot, which has pink and yellow blossoms; Samantha, whose flowers are all yellow; and Tiddlywinks, with orange and yellow blooms. What Tree Has Fuzzy Pink Blooms?